Things I've learned as a runner have helped me a lot as a parent, and vice versa. This photo tells the story better than I can. 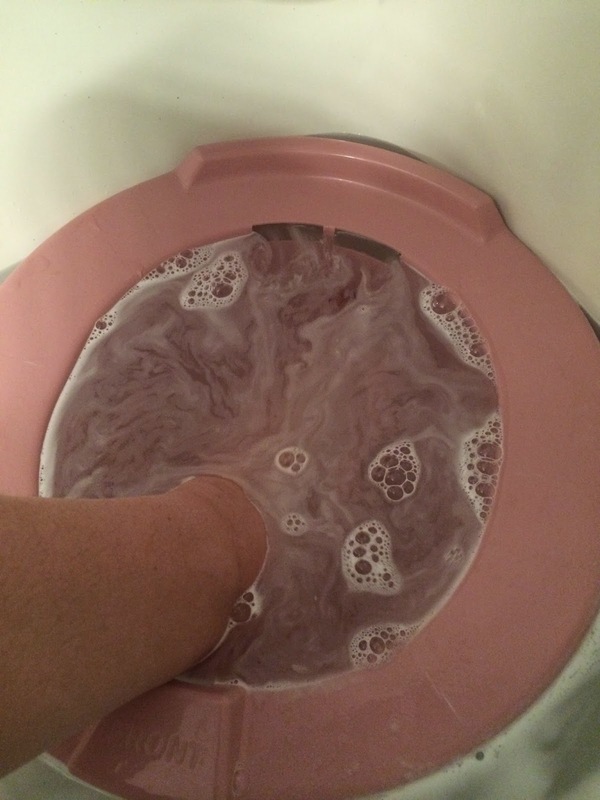 That's me, soaking my sore foot in my sitz bath, which I used to use to soak other sore body parts. This sitz bath has been there for me in times of great need. A true friend. With parenting, when you're trying really hard to avoid one parenting mistake you swing too far in the other direction. No more mean Mom, I'm fun Mom from here on out! Until we're all crashing from sugar highs and no one's done homework in a week and the laundry is blocking the stairs. That's just how my running feels right now. This year, I've returned to running after what was basically a stress fracture in my heel. To reduce the impact on my heel, I've been working to land on my mid-foot. But it turns out I've probably been overdoing it and landing on my forefoot, because now I think I have a neuroma in my right foot. After about two miles into my runs, my toes start to tingle and go numb. Especially my middle toe. It doesn't really hurt but it feels weird. But my last run was my race rehearsal for the Credit Union Cherry Blossom Ten Mile Run. I was supposed to go 75 minutes but I barely made it to 70 minutes, and only 7 miles before I had to stop because my foot and toes actually hurt really bad. Trying to stay off my heels I went too far forward. I was so close to getting to this race without injury. But it's not to be. I'm not giving up on running the race yet. I'm going to see a doctor this week and I'm also going to get those new orthotics I was supposed to get earlier this year and I might even get some new running shoes with a wider toe box and more forefoot cushioning. That's another lesson from parenting for runners: Be Optimistic. It may not be as bad as you think. Or it might.